What is stored at the HDL? Please Note: The High Density Library Reading Room will be closed to the public indefinitely to accommodate a large project. Apologies for the inconvenience. Material in the HDL may be retrieved by online request and will be delivered to other libraries on campus for review within 2 business days. See tutorials on how to retrieve material that is held in the HDL. What? 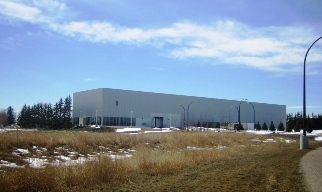 The High Density Library (HDL) is an environmentally controlled remote storage facility for less-used library material. Why? Less-used library material is stored at the HDL, making more space available in campus libraries for high-use material, service space and learning technology. Environmental control helps with preservation of print and archival material. Who? Any user of the University Library in good standing may request material from the HDL to be delivered to the Taylor Family Digital Library (TFDL) or Health Sciences Library. Regular borrowing privileges will apply.